Marine Corps Infantry Officers lead the expeditionary force that is the backbone of this branch of the service. It's up to them to make sure infantry Marines (affectionately known as "grunts") are prepared for ground combat missions. It is a challenging job for a young officer, but the leadership skills they learn are invaluable. The Marine Corps considers this a primary military occupational specialty (PMOS), and it's open to ranks between lieutenant colonel and 2nd lieutenant. This is an unrestricted line officer position. The Marines categorize this job as MOS 0302. Infantry officers lead their troops in combat operations and oversee morale and discipline. They have the difficult job of deciding how to use and deploy weapons and equipment in combat situations, which includes patrols, battle plans, and intelligence. These officers are the commanders or their assistants in infantry and reconnaissance units in what is formally known as Marine Air-Ground Task Forces (MAGTFs). They plan, direct, and assist in the deployment and tactical employment of MAGTFs and any subordinate infantry and reconnaissance units. In offensive situations, MOS 0302 is responsible for employing machine guns and mortars, and they and their troops support offensive operations with assault units. They may employ anti-armor units or demolitions in support of these operations. 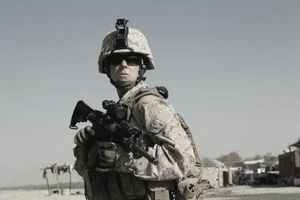 If in a defensive situation, Marine Corps Infantry Officers oversee the use of machine guns and mortars and prepare their company or platoon's fire plan overlay. The infantry officer course at Marine Corps Base Quantico in Virginia is one of the most grueling in the U.S. armed services. Some years the washout rate (those unable to complete it) is as high as 25 percent. It includes completing a total of nine hikes, three of which are evaluated, participating in six tactical field exercises and crossing a 56" wall in 30 seconds or less. The course also requires passing physical standards, which involves completing a 15-kilometer hike carrying 105 lbs. in three hours or less, conducting a ground casualty evacuation (simulated by carrying a 200-lb. dummy) in 54 seconds and lifting a 77-lb machine gun overhead while rushing 300 meters in under four minutes. And although it's no longer required for graduation from the training course, Marines will undergo the Combat Endurance Test, which assesses basic training (boot camp) knowledge and endurance. The aim of the CET is to evaluate whether or not a Marine will succeed in the infantry training. The CET is now used as just one of several tools to evaluate Marine officer candidates. To be eligible for this job, a Marine needs a bachelor's degree and must be a U.S. citizen. A criminal background would be disqualifying. Marine Corps Infantry Officers must be between 20 and 27 when they receive their commission.